Everyone has their own idea of what makes a perfect pizza. Mine is a Margherita, paper thin, with a chewy crust, heavy on tomato and easy on cheese, smelling of fresh basil and extra virgin olive oil. I found it, my perfect pizza, in a tiny shop on Via Buia in Lucca in Tuscany. The shop was 5 minutes from my apartment and I went there almost every day, sometimes twice. Eating pizza from a paper plate perched on a bar stool in a crowded room heavy with silent pizza appreciation is one of my enduring memories of Lucca. I left Italy determined not to compromise on pizza perfection and I resigned myself to a life less pizza. How was I to know that at Dantes Woodfired Pizzeria a near-perfect Margherita pizza was waiting? It was so good that if the bill had been in Euros and not NZ dollars, it would have been perfect. Dantes is no ordinary pizzeria. It is the first in NZ, and one of only 472 worldwide, permitted to display ‘Associazione Verace Pizza Napoletana (VPN)’ on the door. 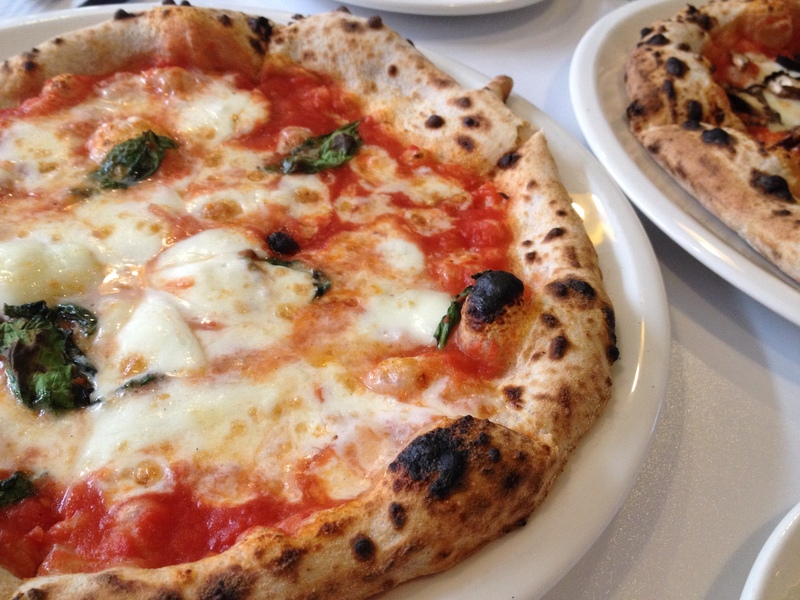 Members of this prestigious culinary club have earned the right to make authentic Neapolitan pizza according to strict standards and requirements set out by a group of pizza makers from Napoli who banded together in 1984 to define the perfect Napoletana pizza and to preserve its authenticity against a tsunami of imposters. It’s serious business, so much so that the Napolitana pizza has been legally granted D.O.C (Denominazione di Origine Controllata) status much like French champagne. Dantes is at Fortieth & Hurstmere a smart new community of eating destinations lined up in a little outdoor lane in central Takapuna. Once you’re there, pizza perfection is only 90 seconds and a very very hot brick oven away.